What does a bird's leg tell you about it? When encountering a species of birds you don't yet know, you can actually tell quite a lot about it when taking a look at its beak and legs. It's much like the way a mammal's teeth may indicate its diet: it's usually accurate, but you should also keep in mind that there might be a few exceptions occasionally, such as in the case of the giant panda, that still has the teeth of a carnivore despite eating merely plant-based diet. Lucky for us nature lovers, we can see the specialized beaks and legs of birds from greater distances, so taking a guess about a bird's "lifestyle" is in some terms easier than doing so in the case of mammals. Even before taking a closer look at the bird's beak or legs, you can find out whether it's a bird of prey or not by looking at its eyes. Those that prey on other birds or mammals have their eyes on the front of their heads, while those that consume other kinds of food will most likely to have them on the sides of their heads. There are, of course, some exceptions - such as storks, that eat small mammals, frogs, fish and lizards, but still have eyes on the sides of their heads. But this is because - contrary to birds like hawks and eagles - they are not actually "hunting down" their prey, but rather foraging for food when they are already on the ground or in the water. Kingfishers are also interesting exceptions, because (although they strike down at the fish from above as a bird of prey would do) they have their eyes on the sides of their heads. Quite a few people think that chickens are herbivores, but it doesn't only show that they know nothing about this species, but also the fact that they missed some of the tell-tale signs of an omnivorous bird. If you take a look at chickens at a slightly more natural environment - in a country yard, for example -, you'll see that they spend most of their days scratching the dirt and looking for small bugs, earthworms and other invertebrates. They will also eat plants, and can even kill mice and other small vertebrates by pecking at them, though this progress usually requires more than just one chicken. (Sometimes they can also become cannibalistic, but that's almost always due to bad living conditions, extreme stress, or the constant lack of some nutrients.) They also use their legs for running, because although they can fly, they will usually just run into a safe place when feeling threatened. Their "lifestyle" also requires feet that are able to "grasp" the branches, because often they will fly onto a smaller tree and spend the night sleeping on it - almost like songbirds. As you can see, nor the beaks, nor the legs can bee too specialized to only one function in the case of the members of the Galliformes order. This is why they have strong legs - but not nearly as strong as the flightless land birds -, ideal for running, scratching the dirt (even digging smaller holes in the ground) and sitting on thinner branches at once. Their beaks are also less specialized compared to those of other birds, with a narrower, slightly pointy shape and a smaller size. If a bird has tiny, almost unnoticeable legs, it's most likely to be busy flying all day long. Common swifts, for example have legs so small that they are barely just claws and tiny toes. That's because this extraordinary bird can basically live its life in the air, without needing to walk or even rest on the ground. It can actually feed, mate and even sleep in the air. It does spend time on "solid ground" tough when nesting, but even then it doesn't need to walk or hop around. The claws are only used when the swift needs to cling to a vertical surface. Hummingbirds also have small legs, as they also feed while in the air. As for the hummingbird, the unique bill is extremely specialized to nectar-eating, while the swift's beak is ideal for catching and swallowing the insects in flight. Wading birds inhabit places that are close to natural waters, such as riversides, reedy areas, lakes and seashores. These habitats require specific skills, such as the ability to wade into the waters and suddenly strike on the prey - that is often in, or near the waters. From the tiny killdeer to the mighty cranes and herons, these birds have distinctive, long beaks and long, slim legs. Other wading birds though have different kinds of bills, depending on what they consume. Flamingos have shorter beaks ideal for selecting the small plankton, while coots, for example, have small beaks resembling somewhat those of ducks. Swimming birds need strong legs with webbed feed as they have to paddle through the water when foraging for food or searching for a mate. Many swimming birds have wide and flat beaks that help them in filtering the food (mostly small animals and plants) out of the water. Grebes and loons, on the contrary, have strong and sharp beaks with which they can grab their prey (that ranges from underwater insects to small vertebrates). Perching feet are one of the most common among birds, and a feature that is a widespread characteristic of songbirds. Three of the toes are pointing forward and one is backwards, which gives the birds the ability to stay safely on the branches. 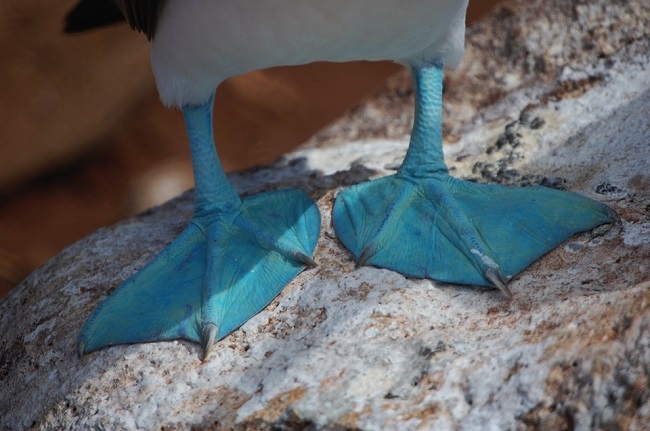 This type of foot can come with various types of beaks, depending on the diet of the birds. Crows and ravens, for example have really strong, pointy beaks, while other songbirds that only eat insects have smaller and less robust bills. Most people will recognize grasping feet at first glimpse - owls, eagles, hawks and other birds of prey can catch, kill and "transport" their prey with the help of the strong toes and sharp, curved talons or claws. The grasping feet almost always comes with a curved, sharp beak that can tear the meat of even bigger birds and mammals. Ostriches are the only living bird species that have only two toes on their legs, but not at all the ones that are fitted with extremely strong and long feet for running. Other species, such as cassowaries, emus and rheas also have thick, robust, long legs and massive feet. Beside running, ostriches and cassowaries can use their legs as a dangerous weapon - their kicks can easily kill even a human adult. Cassowaries can also make impressive jumps to get fruits from the branches. Their beaks are wide and quite short, ideal for collecting plant parts, seeds and fruits. Birds that need to climb in order to find food - such as woodpeckers - sometimes have a so-called climbing foot. This means two of their toes are pointing forward, and two others backward. Another characteristic is that the toes end in sharp and curved claws.